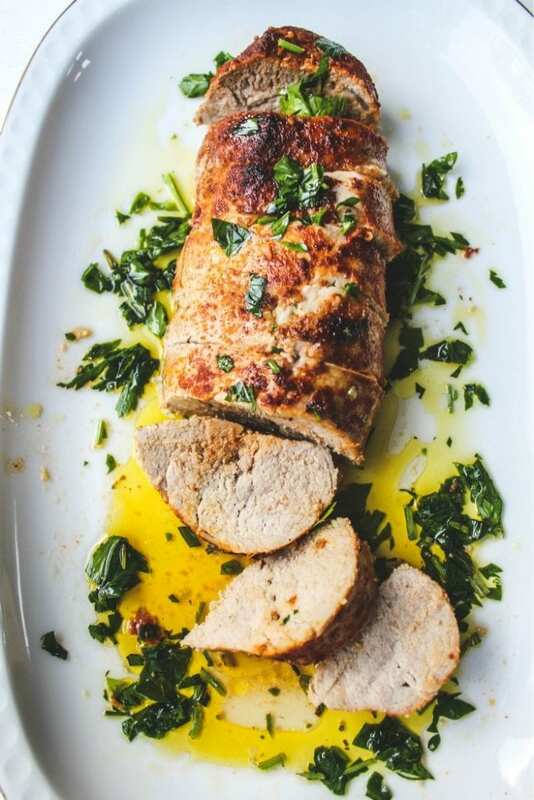 Rosemary and Garlic Pork Tenderloin recipe is delicious, and so very easy to make! The entire family just loves the flavor combinations and the perfect glaze. 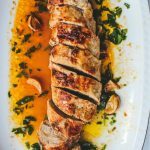 This easy pork tenderloin comes together in less than 45 minutes and is perfect for those that are following a low carb or paleo eating plan. 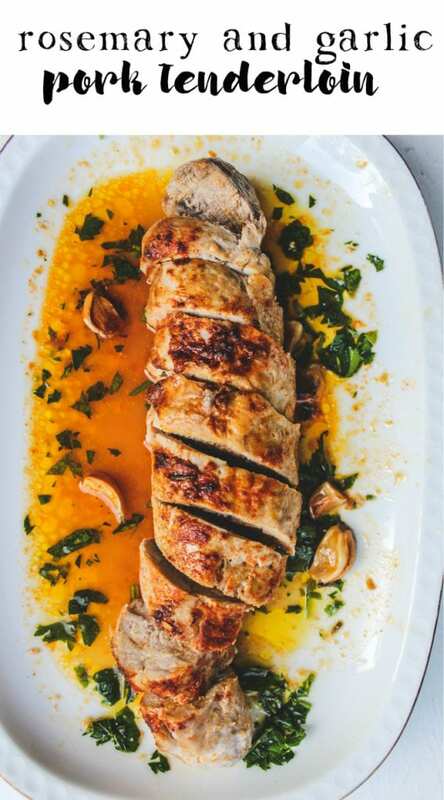 I love to plan a pork tenderloin somewhere in my menu brainstorming for the month. I know that it’s so easy to put together and there are so many different ways to marinate the pork. 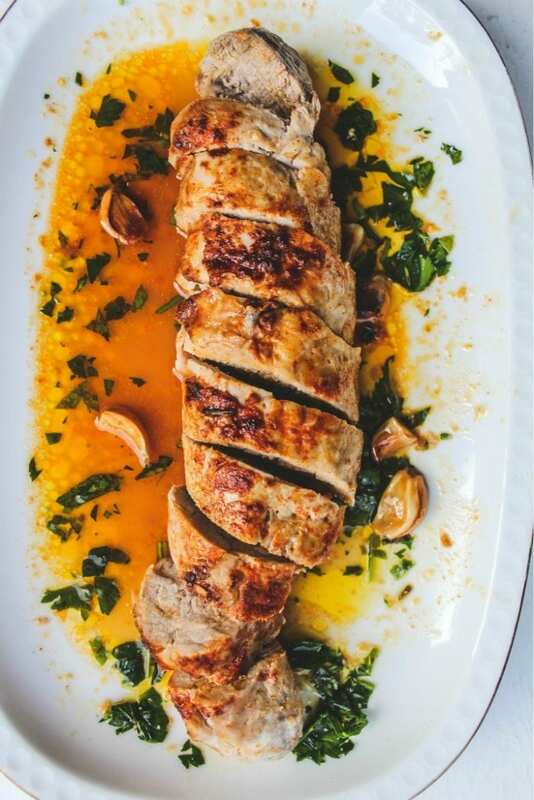 This rosemary garlic pork tenderloin recipe is always a hit with my family. I make a very easy orange soy glaze to serve with the pork that is just so tasty! The most important thing is to not overcook it, so you will need a meat thermometer to check if it’s ready. If you happen to have any leftovers, it is great in a sandwich or even in a wrap or a salad.This is a perfect Italian Sunday supper idea. It’s so easy to make that it could also be a special dinner to make during the week or if you have friends coming over. They will think you worked hours on putting together this delicious meal!! I made two pork tenderloins this time, but in the recipe, I give the ingredients to make just one pork tenderloin. If you do want to make two as I did, just double the ingredients. If you are a true garlic lover, please feel free to add more garlic cloves. They taste wonderful when they are cooked in the glaze. I served this with rosemary roasted potatoes and a mixed salad. As you can see on the before photo that is below, I did a generous sprinkling of the paprika. We love paprika and this is a mild one that I used. While it is baking, the paprika, salt and pepper forms a lovely thin crust. If you want to make a Roast Pork Loin (arrosto di maiale), you should try my recipe that you can find here. It’s a bigger piece of pork and takes a little longer to make, but also is perfect for an Italian family supper or any special occasion. 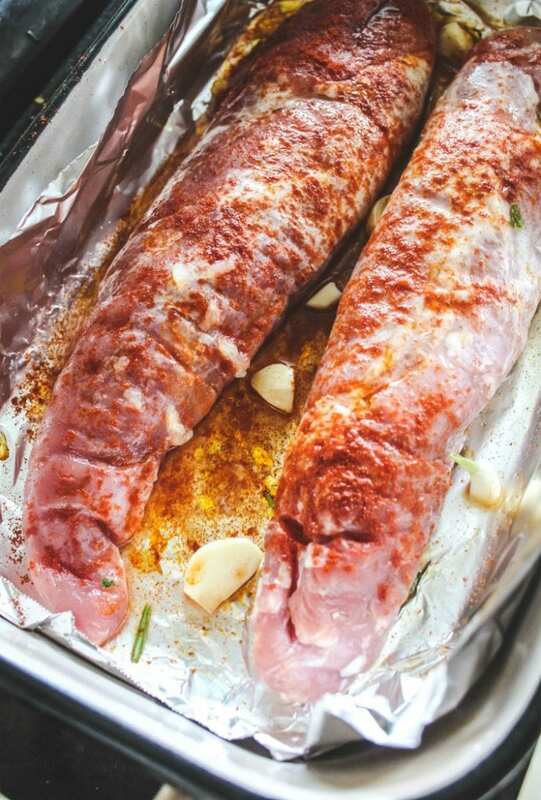 Baking pan: Any large baking pan or sheet will work to make this pork tenderloin. I used a deep baking pan. I like to cook in a deep pan for dishes like this so that the juices don’t spill over and it’s easier to grab the juices with a spoon and baste halfway through the cooking. Aluminum foil: I line my pan with aluminum foil so that the pan is easier to clean up. Meat thermometer: The best way to make sure you haven’t undercooked or overcooked your pork tenderloin is by using a meat thermometer. Preheat oven to 350 degrees. Line baking sheet with aluminum foil. Add tenderloin to the baking pan. In a small bowl, combine the rosemary, parsley and one tablespoon of olive oil. Set aside. Generously season tenderloin with salt, pepper and paprika. Drizzle on the olive oil and add the peeled garlic cloves. to the pan. Cover the pan and place the pork in the fridge while the oven is preheating. While the oven is heating, prepare the glaze. Mix all the glaze ingredients in a small pan and let it come to a lively simmer for 20 minutes, until reduced and slightly thick. The sauce will slightly cover the back of a spoon and look syrupy. At the end of the cooking, you should see large, excited bubbles (this is the sugar caramelizing), so if you don't see those, keep cooking a little bit more. When sauce is ready, set aside. Remove the pork from the fridge and uncover it. Place the pan in the heated oven. When pork is halfway done, drizzle some of the glaze on top of the pork and baste with the juices from the bottom of the pan. If it seems too dry, add 1/4 cup more of water (more if needed). When there are 10 minutes left of the baking time, spoon on the rest of the glaze. Bake until pork is 150 degrees internally at the widest part of the tenderloin (about 25 minutes.) When pork has come to temperature, remove and let rest for at least five minutes to lock in juices. Spoon over the rest of the glaze and toss on top the fresh rosemary and parsley oil. Slice against the grain and serve immediately.